I made a cake for a good friend at work for her wedding. I wanted to make a nice cake, simple, cute and most important fast. I bought a wedding cake topper. I then made a 10 inch round white cake and made almond icing to frost the cake. Then with tip 2D, I made the flowers and the bottom border. Finally I added the dove cake topper. This cake was delicious and beautiful. It's beautiful, and I know it tasted yummy. 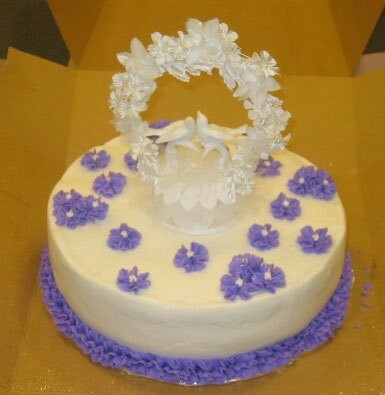 Maria: Love the cake, simple yet elegant. As a retired wedding photographer I bet it tasted better than many I've had as well. Good job. that is a beautiful cake.......hope your friend appreciated it.....good job Maria!!! that is such a nice cake and it looks like it was made at a bakery. Not only was this cake elegant and beautiful, it was absolutely delicious. Everyone wanted seconds! ""